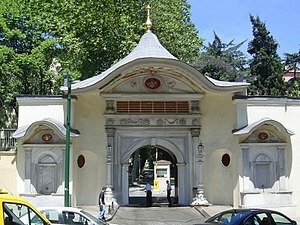 The Imperial Gate (Bâb-ı Hümâyûn, leading to the outermost courtyard of Topkapi Palace, was known as the Sublime Porte until the 18th century. Crowd gathering in front of the Porte's buildings shortly after hearing about the Raid on the Sublime Porte (also known as the 1913 Ottoman coup d'état) inside. The Sublime Porte, also known as the Ottoman Porte or High Porte (Ottoman Turkish: باب عالی‎ Bāb-ı Ālī or Babıali, from Arabic: باب‎, bāb "gate" and Arabic: عالي‎, alī "high"), was a synecdochic metonym for the central government of the Ottoman Empire. The name has its origins in the old Oriental practice in which the ruler announced his official decisions and judgements at the gate of his palace. This was the practice in the Byzantine Empire and it was also adopted by Ottoman Turk sultans since Orhan I, and therefore the palace of the sultan, or the gate leading to it, became known as the "High Gate". This name referred first to a palace in Bursa, Turkey. After the Ottomans had conquered Constantinople, now Istanbul, the gate now known as the Imperial Gate (Turkish: Bâb-ı Hümâyûn), leading to the outermost courtyard of the Topkapı Palace, first became known as the "High Gate", or the "Sublime Porte". When Sultan Suleiman the Magnificent sealed an alliance with King Francis I of France in 1536, the French diplomats walked through the monumental gate then known as Bab-ı Ali (now Bâb-ı Hümâyûn) in order to reach the Vizierate of Constantinople, seat of the Sultan's government. French being the language of diplomacy, the French translation Sublime Porte (the adjective being unusually placed ahead of the word to emphasise its importance) was soon adopted in most other European languages, including English, to refer not only to the actual gate but as a metaphor for the Ottoman Empire. In the 18th century, a new great Italian-styled office building was built just west of Topkapi Palace area, on the other side of Alemdar Caddesi street. This became the location of the Grand Vizier and many ministries. Thereafter, this building, and the monumental gate leading to its courtyards, became known as the Sublime Porte (Bab-ı Ali); colloquially it was also known as the Gate of the Pasha (paşa kapusu). The building was badly damaged by fire in 1911. Today, the buildings house the provincial Governor of Istanbul. "Sublime Porte" was used in the context of diplomacy by Western states, as their diplomats were received at the porte (meaning "gate"). During the Second Constitutional Era of the Empire after 1908 (see Young Turk Revolution), the functions of the classical Divan-ı Hümayun were replaced by the reformed Imperial Government, and "porte" came to refer to the Foreign Ministry. During this period, the office of the Grand Vizier came to refer to the equivalent to that of a prime minister, and viziers became members of the Grand Vizier's cabinet as government ministers. ^ a b c "Porten". Nordisk familjebok (in Swedish). Vol 21 (Papua–Posselt) (Uggleupplagan ed.). Stockholm: Nordisk Familjeboks förslag aktiebolag. 1915. pp. 1418–1419. ^ Albayrak, Ayla (2009). Istanbul. Mondo matkaopas (in Finnish). Image. p. 81. ISBN 978-952-5678-15-4. ^ a b Aysliffe, Rosie (2014). Istanbul. DK Eyewitness Travel. Lontoo: Dorling Kindersley. p. 63. ISBN 978-1-4093-2925-1. ^ a b "Konstantinopoli". Tietosanakirja (in Finnish). Vol. 4 (Kaivo–Kulttuurikieli). Helsinki: Otava. 1912. p. 1295. Wikimedia Commons has media related to Sublime Porte.